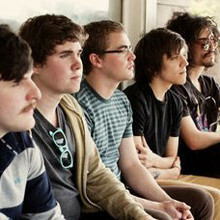 With a warm sound rooted in 90s indie rock riffs and Beach Boys sensibilities, Surfer Blood was already a blogosphere buzz band when its debut album, Astro Coast, was released in January. Now, after months of touring and festival gigs in the U.S. and abroad, the group finds itself near the top of the lineup at the Treasure Island Music Festival on October 17th. 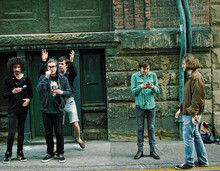 John Paul Pitts (vocals/guitar) spoke with SF Station in a phone interview from a tour stop in Seattle with the Drums. SF Station (SFS): How is the tour going with the Drums? John Paul Pitts (JP): They are really sweet and great guys, and they’re sometimes a hard act to follow. SFS: They are friends of yours from way back. Is it a different experience touring with them? JP: We were never really super close, but we were in bands and we would see each other’s shows and catch up. It’s been a pretty crazy year for both of us. We’ve been pretty busy. SFS: They helped make some introductions for your first record deal. Do they make you haul gear around for them now? JP: No, not at all. It’s not like that. I think [Johnathan is] always looking to find new bands and find out about new music, so he was more than happy to do that. SFS: And now you are on Warner? JP: That’s not really true, and it kind of got blown out of proportion. We’re still on Kanine, and we are just getting some help from Warner. It’s a development type of thing, which is pretty cool because god knows a small indie label like Kanine needs all the help it can get this day in age. SFS: So you’re hoping for more exposure through that deal? JP: Yeah, more money for advertising and radio promo. I think it can really help us take it to the next level. SFS: You’ve been playing some new material on this tour. That must be exciting after promoting the record for so long. JP: Yeah, we’re working on stuff and we’ve been demoing on this tour. We have a bus on this tour, and it’s really nice because it frees us up after the shows to record ideas that we’ve had. SFS: So it’s strictly business on this tour? JP: We definitely have fun. We’ve been touring a lot this year in the U.S. and abroad, so it’s really nice to go back to these towns and see people that we met the first time. SFS: Are you already thinking about some of the new toys you will have access to when you record the new album? JP: Yeah, we’re obviously going to have a lot more at our disposal then we did recording Astro Coast. That was done basically by me and TJ in an apartment with three microphones. It will be nice to get into a proper studio to use everything available to us there. We know the production team that we are going to be working with. They are good friends, who are really talented and dedicated, and they aren’t going to try to rush the project or turn it into something it wasn’t meant to be. SFS: Treasure Island is one of the last festivals in 2010. What was a highlight of one of the other festivals you performed at this year? JP: In Barcelona, for the Primavera festival, which compared to other European fests is smaller and low-key, we got to see Pavement for the first time. It was on the beach with a full moon. That was really beautiful. SFS: Does it feel like an over-night success for you with this band? JP: The last year has been a crazy amount of touring and stress and trying to learn how to deal with the media and press. It happened really fast, but it is really awesome to finally be doing what we really want to be doing. SFS: Did you worry about staying power after all of the Internet buzz? It seems like a lot of buzz bands quickly fall off the radar or implode. JP: Of course, I think everyone thinks about that and they worry that people could go away or forget. Audiences can be pretty fickle and there are so many new awesome bands each day. I think the secret is to keep working, keep writing good songs and music that you like — don’t compromise that. Tour and be nice to other bands and your fans, and you should be able to keep doing this for years to come. SFS: What’s the best part of being a buzz band? JP: Playing our songs for people who are really stoked to hear them and watching them be generally excited to come up and talk afterward. That never gets old for me.